After the announcement of new Galaxy Ace device in Germany last week Samsung won’t hesitate to announce the device globally a few hours go. The Galaxy Ace Style is an entry level Android device aimed at the younger audience. The phone is said to have a "a fun, unique design with an enhanced camera and advanced features for superior performance", I don’t have any idea what is the meaning of that. The dual core 1.2GHz device has a 4-inch display with a resolution of 800 x 480, 512 MB RAM, 4 GB internal memory, 5 MP camera at the back, VGA shooter at the front, Wi-Fi b/g/n, Bluetooth 4.0, NFC and a 1500 mAh battery. While the hardware of the device isn't fantastic, Samsung states that the Ace Style is “designed to support and power young social consumers.” The device will likely be available in both single- and dual-SIM configurations and will come with Android 4.4 KitKat out of the box. 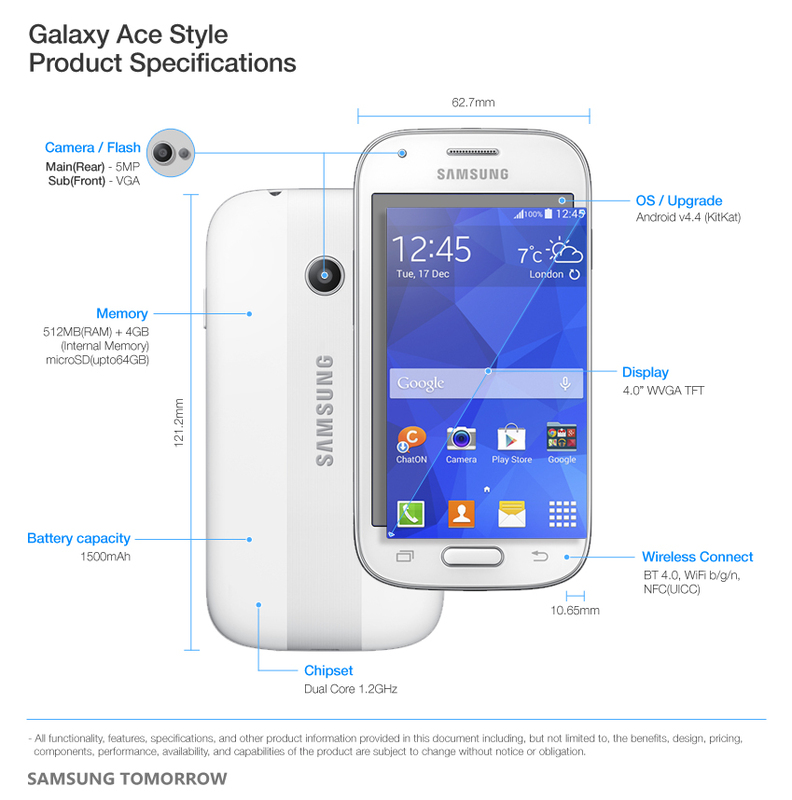 The Samsung Galaxy ACE Style will be available globally in April in Cream White and Dark Gray colors. The price hasn't been officially announced yet, but it’s safe to guess it will cost around $250.